This item which was one of four, was 3m tall and 6m long. 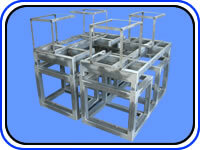 Our facilities are ideally suited to handling large items. 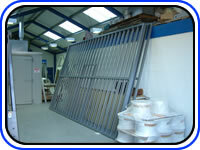 We also coat fire escapes, railings, gates, architectural fixtures and balustrades. It is worth noting that this tall truck would have to use the long approach to the paint shop due to the low bridge, see location map. These wood light boxes were 3.5m tall and 2.3m wide. The first coat was applied to highlight irregularities in the base which were then filled and sanded smooth before further coats were applied in order to create a perfectly smooth finish. 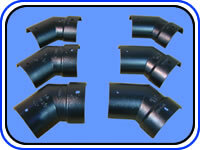 We carry out alot of work on architectural iron work such as these iron gutter members. 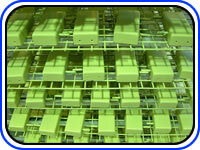 Other architectural features include facial panels, railings and pillars. 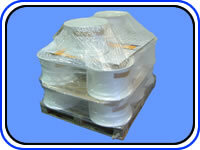 These items are for exhibition stands. We carry out alot of work for exhibitors and exhibition companies around the UK both refurbishing existing equipment as well as coating new items. 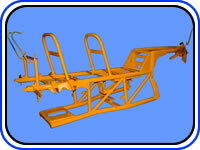 This job was a refurbishment of a quad bike for insurance purposes. The insurance agents original refurbishement agent couldn't get the original paint off in order that the job could be powder coated. The job was then passed over to us, which we had shot blasted clean, and then we coated the framework with a tough durable finish. 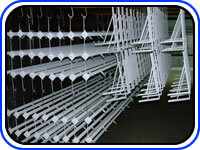 We coat plastic items, which are then air dried. 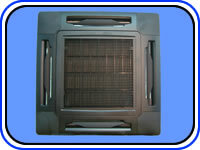 These mass produced plastic air conditioning ceiling grills were originally white, but were to be placed in an office with a black ceiling. We are often required to coat items to match either an existing office interior colour scheme or the companies official colour scheme. These wheels are from fork trucks mounted on the back of lorries and required a corrosion resistant finish to protect them from the salt spray they recieve from the roads. A zinc enriched primer and a polyester top coat were used to produce a corrosion resistant finish capable of withstanding a 2000 hour salt spray test, the equivelent of 15 years external use. 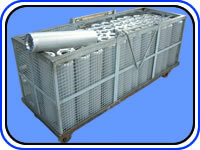 The basket contains machined aluminium components for cleanig. 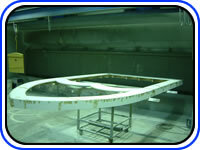 We clean items by either cooking them clean in the oven, jet washing or shot blasting.